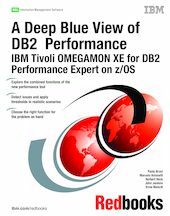 IBM Tivoli OMEGAMON XE for DB2 Performance Expert on z/OS represents the effort on converging OMEGAMON XE for DB2 and DB2 Performance Expert into one product that retains the best features of each. This new tool gives you a single, comprehensive tool to help assess the efficiency of and optimize performance from your DB2 Universal Database in the z/OS environment. It automates the analysis of your database performance in real time and also adds expert database analysis functions to help you maximize performance and enhance productivity. The software combines the sophisticated reporting, monitoring, and buffer pool analysis features of the IBM Tivoli OMEGAMON XE for DB2 Performance Monitor on z/OS and IBM DB2 Buffer Pool Analyzer products. This IBM Redbooks publication will help you install and understand the main functions of the product, clarify the differences, and point out the advantages if you had one of the pre-existing products already in use.